What I’ve changed significantly about my diet over the past few years, is cutting back on refined sweeteners. I’ve adapted a new mentality about really nourishing my body; this means I pick nutritious food over empty calorie or sugar-packed sweets. Sounds easy, but it can be actually quite challenging. Turning down french fries when you are in a relationship with ketchup is never fun and it’s even more difficult to say no to Reese’s. That’s why I create my own versions of treats (like these peanut butter cups) made with ingredients I feel good about. Of course, everything in moderation. I’ll take a real Reese’s peanut butter cup and a slice of pie every now and then. Overall though, I’ve become more mindful of what I’m putting into my body plus how it will nourish and make me feel after I’ve eaten it. A splash of coffee (it adds depth and flavor)! And of course, chocolate chips (DUH)! Mix everything up and you end up with black bean brownies. In muffin form. Yep, I said it: Beans in your brownies. Brownie in a muffin. Totally a thing. Totally amazing. Trust me… please? These are my new favorite late night nibble. Lots of protein, fiber, iron, and good for you nutrients. Full of chocolate love. And you will never ever be able to tell that they’re made with black beans — PROMISE. If you make this recipe or anything else from Ambitious Kitchen, be sure to tag #ambitiouskitchen on Instagram so I can see your creations! To keep up to date with posts and behind the scenes info, follow AK on BlogLovin’, Facebook, Twitter, Instagram and Pinterest. xo! Preheat oven to 350 degrees F. Line a 12 cup muffin tin with baking liners and spray the inside of each liner with nonstick cooking spray. Place black beans and 1 egg in food processor and process until beans are well blended. Add two other eggs, maple syrup, coconut oil, vanilla and coffee; process again until smooth. Next add in cocoa powder, baking powder and salt; process once more until smooth. Next fold in 1/3 cup of chocolate chips. Divide batter evenly among muffin cups. 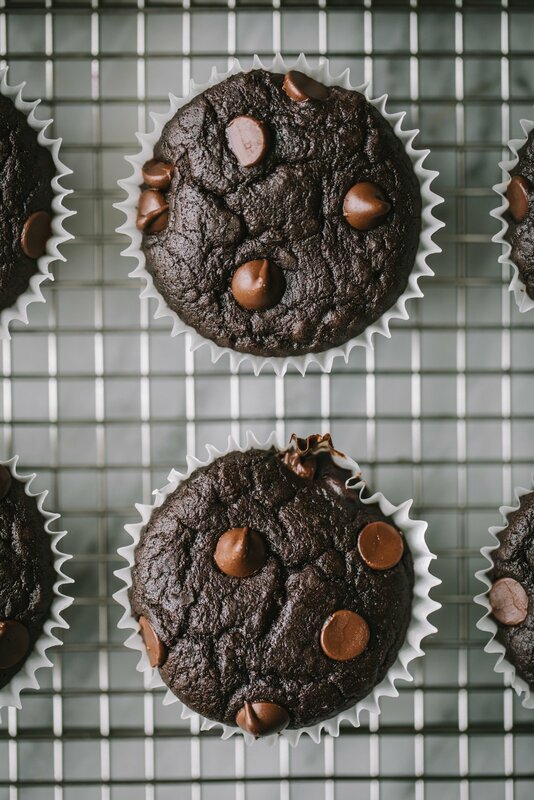 Sprinkle remaining chocolate chips evenly among the tops of each muffin batter. Bake for 25 minutes or until toothpick inserted into the middle of a muffins comes out clean. Place on wire rack to cool for 10 minutes, then remove muffins from tin and transfer to wire rack to cool completely. Keep muffins for a day at room temperature, then transfer to fridge and place in an airtight container. *Use 4 eggs instead of 3 if you'd like a more cake like consistency. 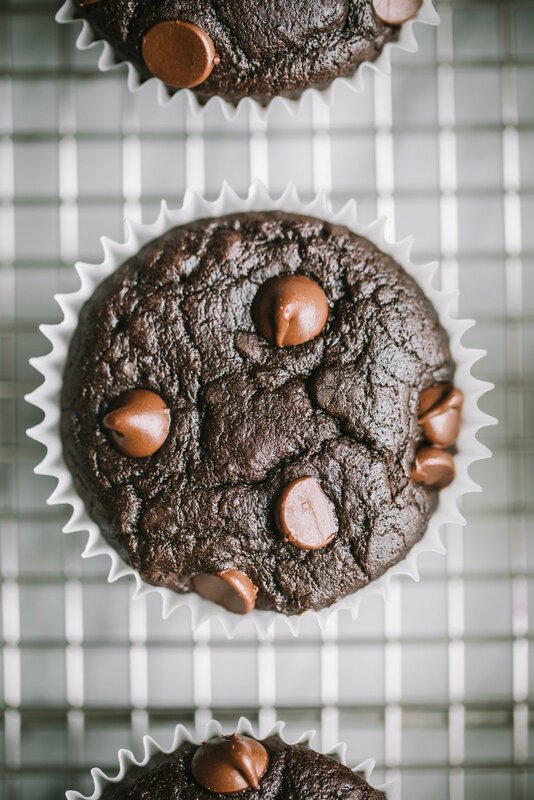 115 Responses to "Flourless Black Bean Brownie Muffins"
I keep hearing about this black bean in baked goods shenanigans and I have been wondering if that is actually, well, tasty. And these look DELISH. Looks like I am coming over to the beans in baked goods side. Pinned! did you make them? How did they taste? These look amazing monique – just pinned! I have such a sweet tooth and am always looking for recipes for healthier sweets. Thank you! These muffins look delicious! I love that they have healthy black beans in them, great recipe! I would love to try these with raw cacao! And the coffee tip sounds so handy! Did you ever try cacao instead of cocoa? How was it? 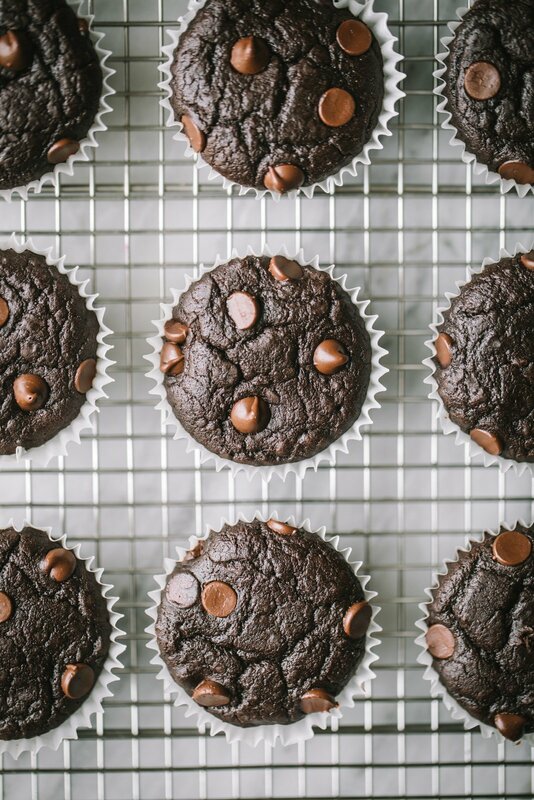 I love black bean brownies, but have never considered making them into little muffins! My husband and I decided that we would attempt to eliminate most refined sugars from our diets during the month of March…two days in and I’m already disliking it! I’m a little iffy about black beans in dessert, but you’ve never steered me wrong in the chocolate department before (or any department, for that matter), so I’ll have to give it a try! I have been working on the same goals. Being mindful of what I put in my body. Unfortunately sometimes my mind and my body don’t lineup and I end up eating something that makes me feel awful and effect my workout. I’m so excited to try these!! I make your oatmeal cottage cheese pancakes multiples times a week and they are a life saver! I can definitely testify to the natural, healthy goodness and the absolutely deliciousness of Black Bean Brownies! I’ve been making them for years. 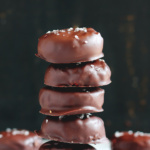 Gluten-free is the only way I bake, and these little jewels are a staple in my chocolate dessert collection. 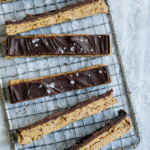 They pass both the gluten-free and nutrition standards that I require in my meal preparation AND the chocolaty yumminess that my husband (who thinks of chocolate as its own food group) craves! MOST brownie lovers for whom I have baked these delectable goodies NEVER suspect that they’re gluten-free, much less that they contain black beans as the basis for their flourless nature. They’re floored when they learn the truth. Interestingly, they always come back for more and request THESE brownies – with all their gluten-free, black-bean, AND chocolaty goodness! This recipe is top-shelf! Can I use other beans, eg. kidney? I used kidney beans and agave syrup and it was delicious. My gluten free, picky seven year old ate these up! 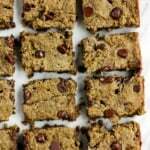 I am thankful for this recipe, I fed her these for breakfast with a smoothie, yum! I enjoy black bean brownies so I’m sure these are delicious but where does the third (or fourth) egg get added in? If I read it correctly it says to add one egg and then add another egg. What about the others? Thanks! Awww so sorry, all fixed! I just made these, all I have to say is delicious and no guilt. I would recomend . Fabulous! Glad you liked them. Thanks for leaving a comment! Do you have. Arecipe without chocolate and coffee ? I dlove to try the beans ..but hate coffee and chocolate ??. 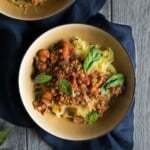 Could you incorporate zuchinni in this recipe and if so would o take out the oil? I would love to know too! I might try! You need to wring out some of the moisture from the zucchini if you put it in. I grate the zucchini, put it in a clean dishtowel and wring it out. I’m sure there are other ways to do that but that’s what I use. I wonder if I could substitute applesauce for the fat? I don’t want to buy coconut oil. I guess I’ll experiment and see what happens. Any idea what size tray to use if I want make regular brownies, not muffins? So yummy! I added some pink himalyan seasalt, and used the tbsp of coffee to bring out the chocolate flavour. the recipe is very tasty. Not overly sweet, yet very chocolatey, you dont taste the beans, and i used three eggs and found the texture to be fluffy and moist. *tip: i didnt have baking powder, so i used 1 tsp of sodium bicarbonate (pure baking soda), and added 1 tsp of apple cider vinegar. So the acid would react with the sodium bicarbonate to create the same reaction. *Also, i used dried beans, soaked then cooked, then measured 1.5 cups after cooking them. I will definitely do this again!! Looks great. I had to try baking these and used chocolate nibs. Yummy! These things are awesome, although I guess that I have not really made them. I did not have black beans in the house so I made them with pink beans and have a batch with small red beans in the oven. Thank you, thank you, thank you!! If I made these in a mini muffin pan, do you think it would work out ok? i don’t have a food processor, but i do have a blender. will that work fine for this recipe? Do you have a Vitamix? I would recommend that over a regular blender. Instead of cocoa powder, can I use raw cacao? Made these tonight and WOW are they amazing! The kids even devoured them! They were better than any chocolate cake I’ve ever eaten, no lie. Plus you barely need to do anything since it’s all blended in the food processor. Totally making these way more often. ? Where does the salt come in? After the baking powder. The salt is optional. Hello! Hoping to try these out today. 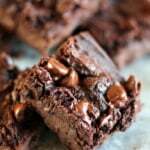 Is it possible to freeze batches of the brownies? Love these muffins! Can these be kept in the freezer? Thanks for being awesome, Monique! Love this recipe and have made them numerous times. I’ve tried one other black bean brownies recipe that added protein powder it didn’t cook well. Do you think protein powder could be added to your recipe without ruining it? Thanks for any tips and for the wonderful recipe! I made these today as I’d wondered about the black bean thing! Didn’t tell kids…they loved them! My 12 year old was shocked to hear then proceeded to eat another one! I was thinking of replacing eggs with applesauce. Anyone tried that??? Just made these Delish!! !.I will be making these again. I’m trying my best to eliminate all whites from my diet. I have Fibromyalgia and my doctor suggested getting sugar and flour out completely. I am dying for a sweet treat so this is going to be it. I’ve made a cake once with black beans before and it was delicious and moist too, but was made with Zylitol, which I understand isn’t good for you so here goes. Any recipe for cookies? Love my cookies! Just made these…delicious! I think I have to get used to the consistency of it as I am reminded of black beans, but the taste is perfect. Not too sweet and really soft. Please note: I only have a small food processor, so after processing the beans and egg, I did the rest by hand mixing, which could affect the consistency. Thanks for the recipe! I made them last night! Soooooo yummy! Is it possible to store these at room temperature rather then in the refrigerator? They’ll be fine at room temperature for a couple of days, and then I would transfer them to the fridge to keep them fresh! I made these tonight and All that needs to be said is that they’re SO GOOD! Well don’t these just look yummy! A splash of coffee makes everything better. Love how simple this muffin recipe is, and grain-free too! I have never actually baked black bean brownies, but I love baking with beans! 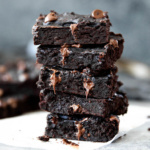 Black beans have been on my radar for FOREVER so I must try making my own vegan brownies soon! YES these should work with flax eggs too! These did not work for me but it was COMPLETELY my fault. 1.) I used 4 flax eggs and 2.) used silicone muffin liners because that is all I use now. Maybe the silicone did not allow the mixture to ‘breathe’ and release enough air? I ended up with ‘batter cups’ after leaving them in the oven for 25 minutes. They slipped right out of the liners though…small win! I’m still stoked though because the batter tasted SOOO good (and not like black beans) I could not throw it out! I dumped my ‘batter cups’ in a bowl, added a few tablespoons of coconut flour to soak up some of the moisture and plan to leave it in my fridge and eat it like brownie batter! It’s seriously delicious! can I make them in mini muffin pan how long for baking? Sure! I would start with about 12-15 minutes and then check on them from there. These are delicious and not dry like other black bean recipes I’ve tried! Love the coffee addition too! If I hadn’t made these brownies I certainly would not have believed they were made with beans! They are moist and delectable! I used pinto beans because that is what I had on hand and they worked great. I have yet to come across a recipe from this blog that isn’t awesome! Thanks, Monique! I’ve made these muffins so many times now they’re so darn good! So happy to hear that Emma! Can flax eggs be used to cut down on the amount of eggs? Yes flax eggs should work! Delicious! Only wish I’d had muffin cups on hand; they’re a bit messy to tackle without. Flax eggs should work in these! I made these tonight and they were a huge hit in my house with my kids and myself. Thank you for the recipe! I am trying to bake healthier treats and reduce sugar consumption and this is a perfect way to start. It was so easy that I can make these all the time. Made these tonight following the recipe exactly (with the added 4th egg for more cake-like consistency), and they are soooo good! Their rich flavor will definitely satisfy any chocolate craving! Batter was very runny with the extra egg, next time I might try without. Thank you, thank you!! So glad you liked them! One of my fav weeknight treats. I have been seeking to eat healthier to balance my weight, bring down my blood pressure, to get rid of my constant heartburn and to just feel more energetic. After two weeks I have noticed a huge improvement and am thrilled. I have missed my sweets, but I must admit, not nearly as much as I thought I would. I saw this recipe and decided to make it up and see if this would satisfy my sweet tooth. The muffins were light, fluffy and very chocolatey with just a hint of coconut!!! The perfect answer to my cravings. And to top it off, each muffin gives me almost 5 grams of protein!! Talk about a win-win!! Thanks for posting. I love how they are healthy like a morning muffin should be and can therefore have it alongside my morning shake but these could EASILY be considered a dessert cupcake too. Absolutely delicious! My new go to! Can these be baked in a cake pan rather han muffin cups? If so wgat would cooking time be? That sounds delicious. I’m guessing around 18-25 minutes in an 8×8 inch cake pan, but you may need more time. Are the cupcakes to remain uncovered for a day, before being transferred to an airtight container and refrigerated? I was honestly shocked with how yummy these are. Perfect with a glass of milk! I am officially converted to the whole beans in baked goods trend. I made them subbing applesauce for the maple syrup (I avoid all sweeteners) and they were still great! So glad you gave these a try! The perfect treat. Hi thanks for the recipe! Will I be able to reduce maple syrup to 1/4 cup and still get muffins good? 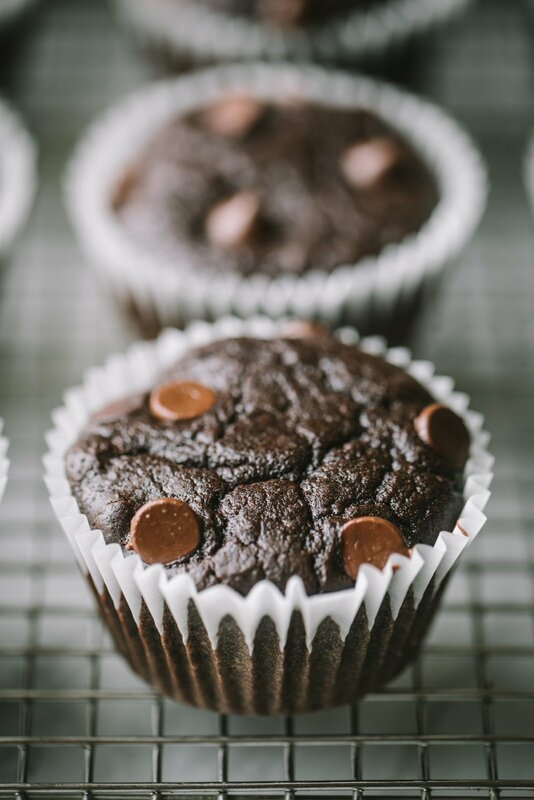 I did bake your skinny banana double chocolate muffins and turned out great! My picky 8yr old loves them! Hi! Unfortunately I don’t think so in this recipe. These muffins call for the right amount of liquid so that they stay moist. 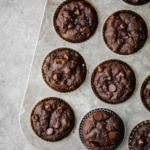 So glad you both love the skinny banana double chocolate ones – one of my fav muffin recipes!